Heat oven to 350°F. Line 2 (9-inch) round cake pans with foil; grease bottoms only of foil with shortening or cooking spray. Make brownie batter as directed on box. Divide batter evenly between pans. Bake 19 to 22 minutes or until toothpick inserted 2 inches from side of pan comes out almost clean. Cool completely in pans, about 1 hour. Do not remove from pans. 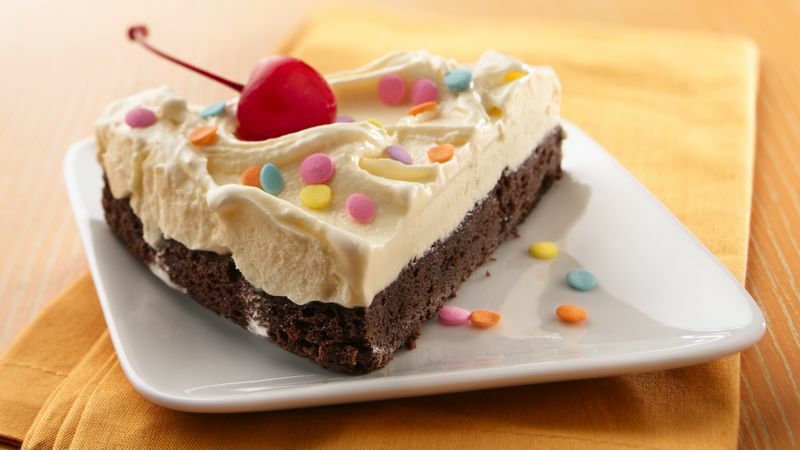 Spread slightly softened ice cream evenly on brownies in pans. Freeze at least 2 hours until ice cream is firm. Remove desserts from pans; remove foil. Place on serving plates. Cut each dessert into 8 wedges. Decorate with candy sprinkles and cherries. Store covered in freezer. Use your favorite flavor of ice cream or a combination of ice creams to make this frozen dessert. For a thicker brownie crust, use 2 (8-inch) round cake pans; bake for 24 to 26 minutes and top with 6 cups of softened ice cream. Set up a dessert bar with ice cream toppings and syrups and extras such as fresh strawberries, sliced bananas, chopped nuts and candies. Let guests build their own desserts.